This is literally one of my FAVORITE dishes we’ve cooked and I’ve posted. I was at work the other day and Greg texts me “I’m cooking tonight”.. so all day I really didn’t know what to expect until I got home. When we cook, we rarely make the same thing twice, so I figured it would be a new recipe. When I got home, he said that he’s making chicken chilaquiles! WHAT. I was super excited, because really I’d never heard the word until about two months ago when I visited Birmingham. 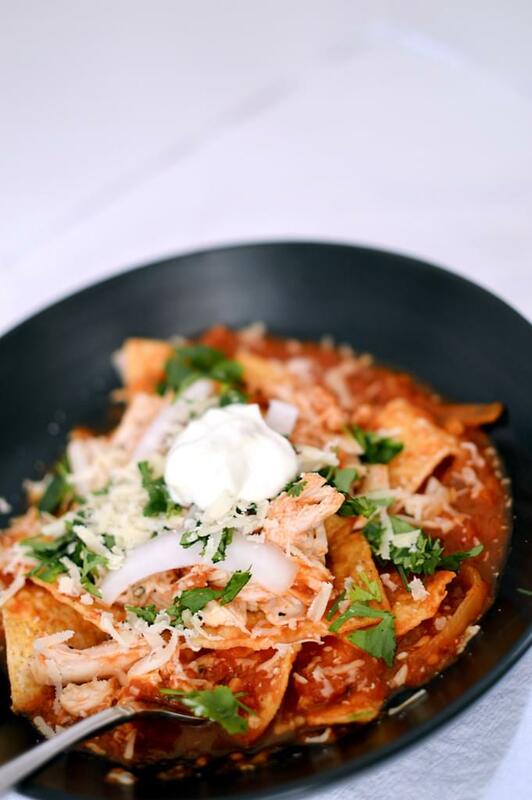 We went to a crazy-good brunch place called El Barrio Restaurante, and I got a dish called the ‘Chicken Chilaquiles.’ I didn’t really even know how to pronounce it when I ordered it, but when I got it I was like “Hell yes, chilaquiles are just a fancy word for nachos!”… I LOVE nachos. 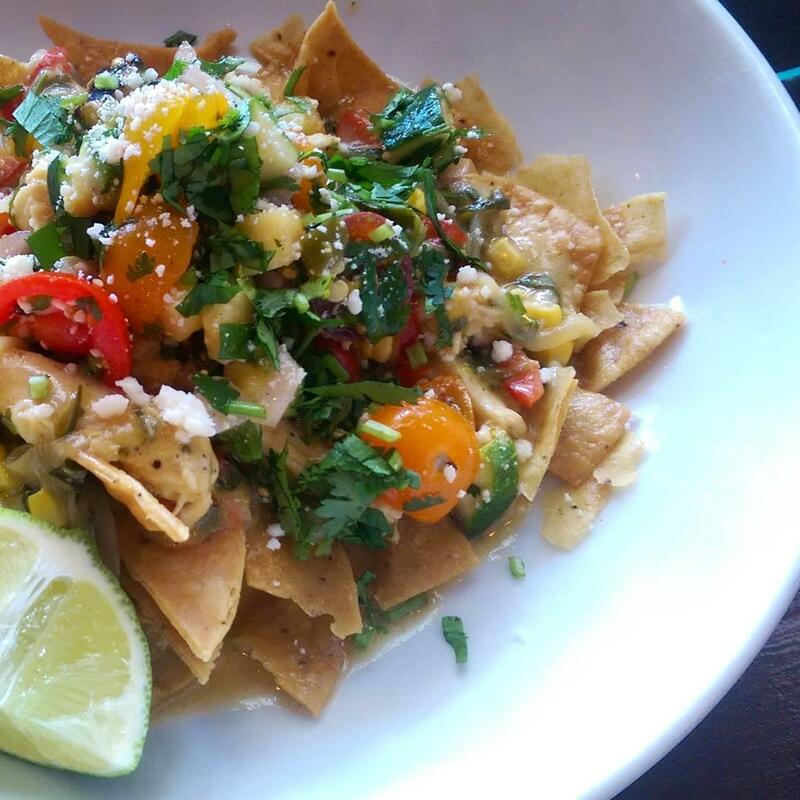 Fancy nachos for brunch! ?… I am totally down with that. (After looking at the Wikipedia definition I think the only difference is the corn tortillas are fried until crisp and simmered a bit with a salsa or mole sauce.) 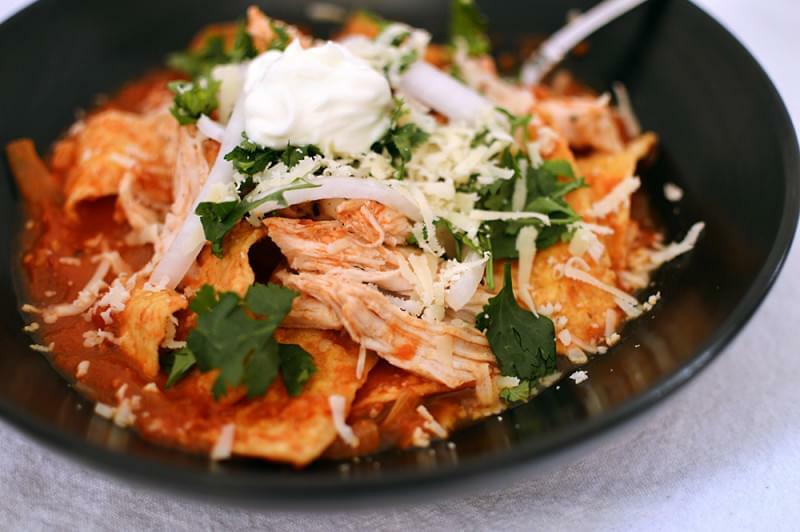 Below is my Instagram from that day, and ever since I finished THOSE chilaquiles.. I’ve wanted MORE chilaquiles. When I read the description, I didn’t really know exactly what to expect when they came out because really the description was just the following words — in this order: cojita cheese, peppers, tomatoes, zucchini, corn, tequila, crispy tortilla strips, and lime I like ALL of these things, so my menu pick seemed obvious. I checked their website today to see what the description on the brunch menu, and I found the following: white beans | chipotle | sweet peppers | crispy tortillas | spiced slaw | cotija | house crema | hot sauce Obviously they change it up for the seasons, but these sound absolutely amazing as well! I’m due for another trip soon! 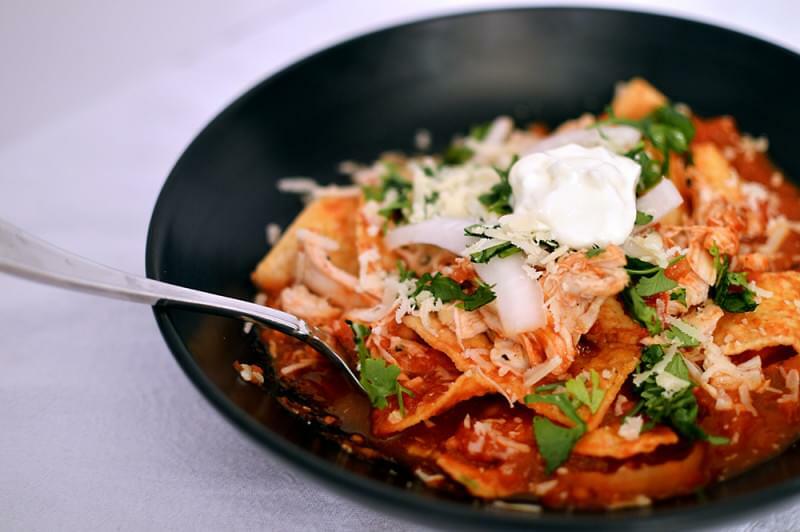 Anyways, Greg found this Chipotle [Chicken] Chilaquiles recipe from Food & Wine Annual Cookbook 2008 (these old Food & Wine annual cookbooks are ridiculously cheap <$5 , and have some of our favorite recipes) and it turned out AMAZING. I love all of these flavors — especially the chipotle salsa, corn chips, and shredded chicken. 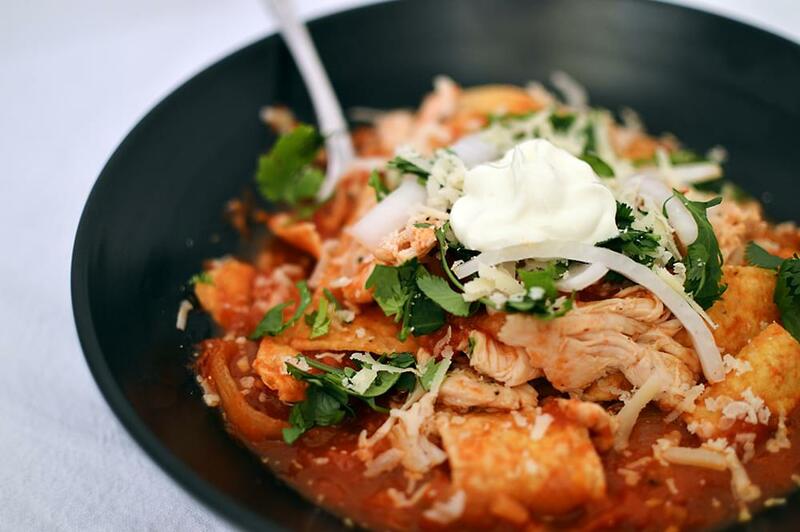 The sour cream lightened up the sauce and helped balance the spice, and the cilantro made it taste so fresh! The chipotle salsa was some of the best we’ve made at home. We had plenty left over so we used it as a dip for chips the next few nights. Still JUST as good as it was in the recipe (if not better). The cilantro and sour cream helped balance the spice as well. It was QUITE spicy, so if you are spice intolerant, make sure to competely de-seed the chipotle peppers. Greg left seeds in one pepper and removed them from one. It was still very spicy. 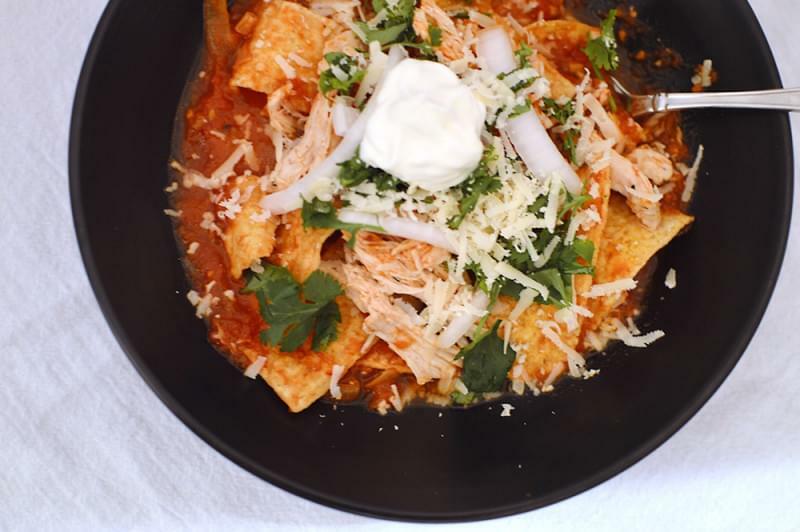 We used store bought tortilla chips (Mission Tortilla strips, to be exact) and they were nice and thick to hold the toppings and not get too soggy when coated with the salsa. I loved the crunch of the still semi-crispy tortilla strips and the raw onions. Greg baked the chicken breasts and shredded them with two forks, but you can grill or boil the chicken — just get ’em cooked. Since I was unable to find queso anejo, we used Parmesan and it was absolutely delicious. I think really any mild cheese would work on these. I can’t brag on them enough! I can’t wait to experiment with even more fancy nachos and share my creations. This recipe knocked it out of the park.